Originally posted on 8/18/10 at Nerd Caliber’s Blog of Inquiries. 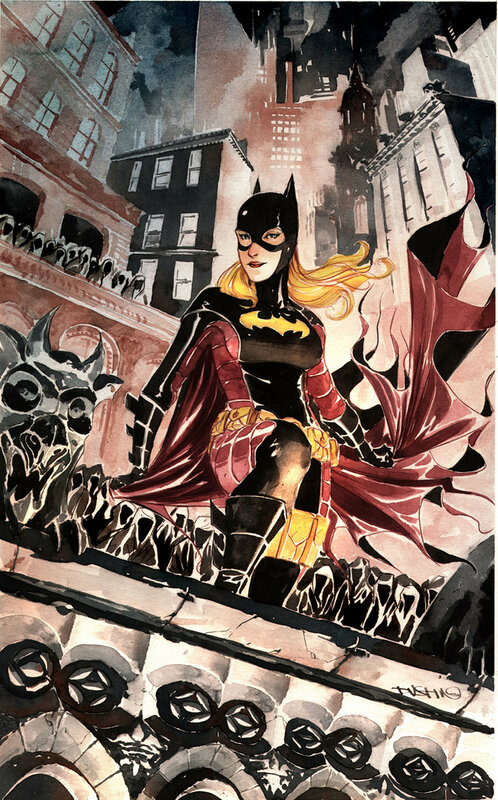 Dustin Nguyen takes on artistic duties as of Batgirl #15. The DC solicitations for November are out, and it looks like Batgirl‘s getting a new artist in fan-favorite Dustin Nguyen. While it certainly piques my interest to see how Nguyen’s unique style will suit the fun and adventurous tone of Batgirl, I’m sad to see the stellar and consistent art of Lee Garbett leave the show. Garbett’s work has been a fantastic accompaniment to Bryan Q. Miller’s script, bringing Stephanie Brown to life as the titular character, and now, heading into year two, the general concensus seems to be that fans are happy with how the book’s been handled. I don’t know about you, but when I’m happy with a team on a book, it can sometimes be jarring to learn of a creative change being made. Despite the fact that the duo of Miller and Garbett have been tackling Batgirl for over a year now, it still feels like such a small amount of time. One year is just long enough for me to grow attached; having the rug swept out from under me with an artistic change–despite the fact that I like Nguyen and am interested in seeing his take–is admittedly somewhat disappointing. Such a shuffle, then, raises the question of whether or not creative teams should be required to stay on a title for a certain length of time. Marvel’s new Black Widow series, for instance, is already doing the creative team shuffle after just one story arc! I signed up for Marjorie Liu and Daniel Acuna, but as of issue six, I’m getting Duane Swierczynski and Manuel Garcia. Is this fair to the reader? Barring unforseen circumstances, should there be a required creative commitment of at least one year to start? Perhaps more if things are going well? Despite how this post may sound, I do like change. It’s part of what makes comics so great and exciting–the constant “new.” But you know what they say–if it ain’t broke, don’t fix it. While I will continue to read and remain loyal to this title, right now, I almost wish they’d leave it alone just a little bit longer. I’ll miss you, Mr. Garbett–thank you for 14 great issues. This entry was posted on 08/25/2010 by ravenhaired. It was filed under Comic books and was tagged with Batgirl, Bryan Q. Miller, DC, Dustin Nguyen.